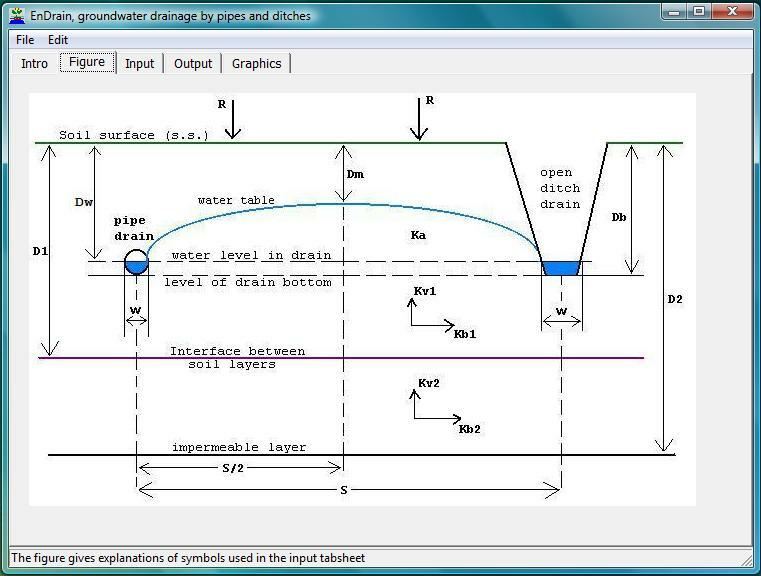 The EnDrain computer program calculates the drainage discharge, hydraulic head, or spacing between parallel subsurface (sub-surface) drains: pipe/tile drains or open ditches, with or without entrance resistance and shows the curve of the watertable (water-table). The computations are needed for the design of subsurface drainage systems of rainfed or irrigated agricultural land for waterlogging (water logging), watertable (water table) and soil salinity control. EnDrain can be used for the reclamation (remediation, rehabilitation, restoration) of saline (salty) soils. The simulation software is free for download. It can be called shareware (freeware) and is in public domain. The drainage equation used is an amplified version of Hooghoudt's equation. The drain spacing calculations are based on the concept of the energy balance of groundwater (ground-water) flow. However, the traditional concepts based on the Darcy and waterbalance (water balance, budget) or mass conservation equations are also used. The program allows for the presence of three different soil layers with different hydraulic conductivity and permeability: one layer above and two below drain level. The last two layers can also have different horizontal and vertical hydraulic conductivity or permeability (anisotropy). On 21 May 2012 the auxiliary Fortran programs of the EnDrain model were eliminated and the contents were integrated into the Delphi program. The program starts clicking on EnDrain.Exe. More information is given in the program itself. On 10 August 2010 the program was improved thanks to comments of Nicolas Deeks. On 14 June 2011 the user interface was improved thanks to a request of Robin Johnston. On 17 May 2012 the EnDrain program was improved thanks to suggestions by Pepe del Monte. Publications on the physical and mathematical theory of the energy balance of groundwater (ground-water) flow and examples of EnDrain applications are found on the articles page or directly as energy or balance PDF documents. A list of publications using EnDrain is found on this page. A comparison of required drain and well spacings for horizontal resp. vertical drainage under the same conditions can be seen in the spacings page. An article on the use of EnDrain for subsurface land drainage by pipes was published in the International Journal of Research in Agriculture and Forestry: Subsurface drainage equations using the full energy balance of groundwater flow in layered and/or anisotropic soils. A similar article, with emphasis on ditches, can be seen at this site. When it is required to sumulate the drain discharge as a function of time, given a time sequence of rainfalls of irrigation applications, use can be made of the hydrological runoff model RainOff. 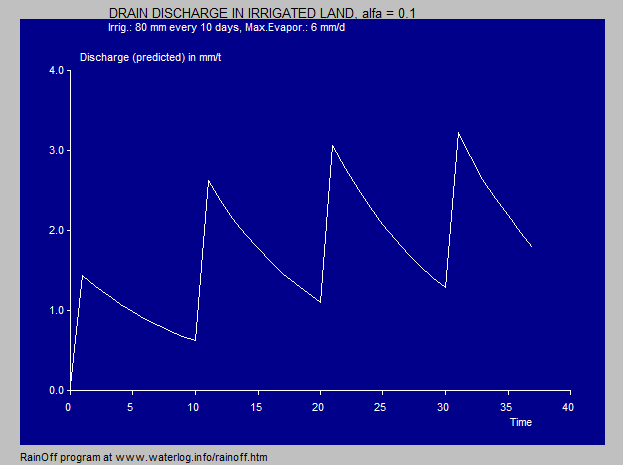 It gives an example of drain discharge simulation in the "Data" file. The drainage system is to be characterised by a response function (or reaction factor) alpha = A * runoff + B, as can be seen using the option "Predict discharge or runoff from rainfall given the alpha function" in the input tabsheet. See the example in the last figure hereunder. The RainOff program gives also a time series of hydraulic heads (water levels) in the output file. These data can be used to depict the fluctuation of the level of the water table with time. For improvement, I am interested to learn about your experiences with EnDrain. For this there is a contact form. The software site Actiweb shows a summary of the user interface of Endrain in Spanish. In the EnDrain application software, the drain spacing and discharge depend on the hydraulic conductivity of the soil (K), the depth of the water table (Dm), the position of the impermeable layer, the diameter of the tile drains or the width of the ditches (W), and the depth of the drains (Db). With the EnDrain model, these relations are accurately calculated, so as to obtain an optimal drain spacing and subsurface drainage system. the water table diminishes with the distance from the drains. According to this program, the water table is flat midway between the drains (at half the distance of the drain spacing), elsewhere it is curved.